Shawna Pennock has been described as “rich and powerful, yet lightly effervescent” (Classical Voice of North Carolina). Dr. Pennock is the Adjunct Professor of Saxophone at University of Nevada, Las Vegas. At UNLV, she teaches applied saxophone, music theory, woodwind pedagogy, and coaches chamber music. She recently earned her Doctor of Musical Arts degree at the University of Georgia. She holds a Master of Music degree and a Professional Artist certificate from the University of North Carolina School of the Arts and a Bachelor’s of Music with an Education certificate from The University of Iowa. Her former teachers include Connie Frigo, Taimur Sullivan, Kenneth Tse, and Robin Ciccotelli. 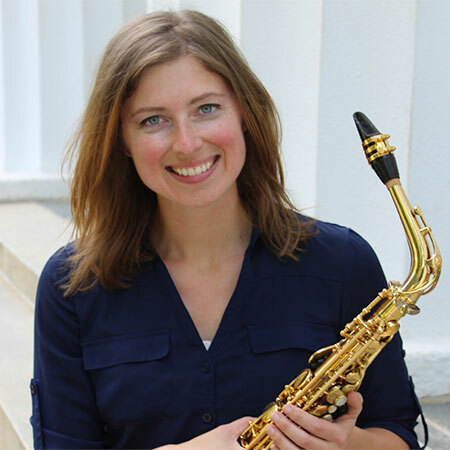 She has won top prizes in competitions including 1st Prizes at the North American Saxophone Alliance Quartet Competition, ENKÖR Chamber Music Competition, Southern Division of Music Teachers National Association Chamber Competition North Carolina MTNA Chamber Competition, University of Georgia Concerto Competition, and the North Carolina MTNA Young Artist Competition. She has performed across three continents in Panama, France, Hong Kong, Thailand, Russia, and the United States. An advocate for contemporary music she has premiered over 20 works. She has worked with composers such as Joel Love, Al Thiesen, Sam Lipman, Corey Dundee, David Vess, Kathryn Koopman, Bruce Tippette, Aaron Jay Meyers, Owen Davis, K. Scott Eggert, Sally Wyche Cohen, and Stephen Medlar. Her debut solo CD Fledglings includes new works pedagogically conceived for saxophonists exploring extended techniques. She worked closely with the composers to incorporate extended techniques in ways that guided the saxophonist to properly execute each technique. Pennock is currently the tenor saxophonist for the Dasch Quartet. Formed in 2013, Dasch Quartet has rapidly developed a reputation as one of the most exciting emerging chamber ensembles in the United States. Dasch is as proficient in the music of living composers as it is of those of the past. Their debut CD "Necessary Edges" a collection of romantic string transcriptions by Dvorak, Puccini, and Smetana, was described as "immaculate" and "exquisitely done and played" (Clarinet and Saxophone Society of Great Britain).